If you’ve been following my Instagram, you would have realised that the annual Epicurean Market at Marina Bay Sands is currently on until 13 August Sunday. This is already the 5th year and the event is bigger than ever before! If you’ve always wanted to check out the Celebrity Restaurants, now’s the time to do so because many of their signature dishes can be sampled for a fraction of the price it would cost at the restaurants. 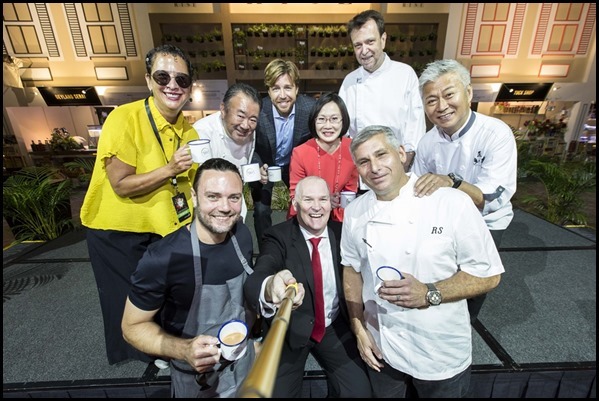 This year, aside from Celebrity Restaurants, enjoy the Singapore Street Food experience by trying local dishes/hawker fare presented by the newly refreshed RISE Restaurant. And of course not forgetting over 30 masterclasses, tasting sessions, special appearances, bespoke cocktails. And before you leave, take home some fresh gourmet produce from the Farmer’s Market. Each $39 per ticket gives you unlimited entry plus a $15 signature dish of your choice. OK with so many celebrity and signature restaurants to choose from, how do you decide where to spend your money? After sampling each of the restaurants during the media preview on Friday, here are my top 5 picks based on taste, value-for-money and uniqueness. Enjoy! 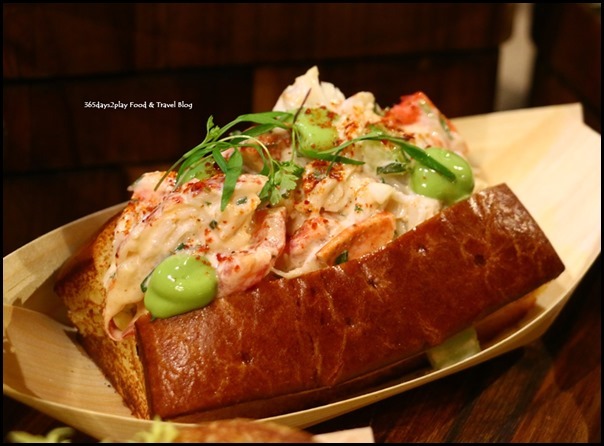 If you love lobster rolls, you will know that they cost a pretty penny in Singapore. I know of some restaurants/cafes to be charging in excess of $40 per roll! So this $25 lobster roll from DB Bistro is great value considering the size of it and considering that it’s from DB Bistro. It’s big enough to actually be sufficient as a meal too, if you are on cost-savings mode. With practically every restaurant offering dishes boasting premium ingredients like crab, lobster and carviar, it’s hard to choose a favourite because they were all good. This sweet corn agnolotti with truffle shavings might just be my favourite dish from Epicurean Market. It’s so different from the other dishes. 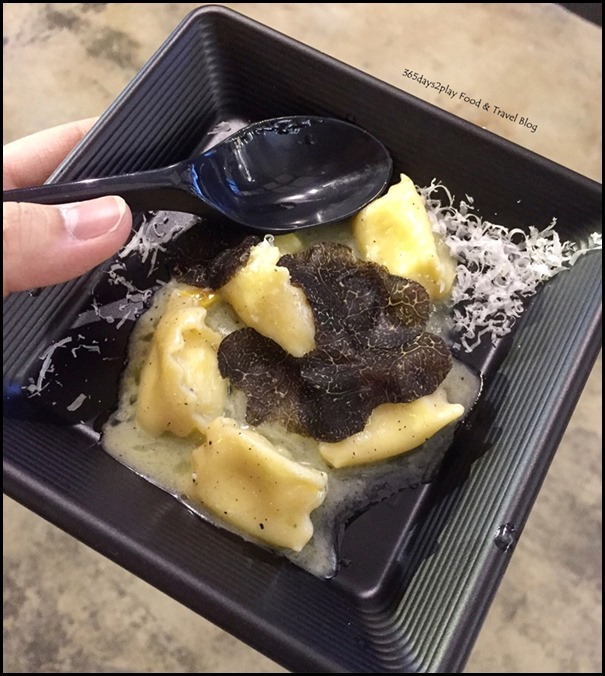 I really like the pillowy soft pasta parcels bursting with sweetness, and the earthy contrast of the truffles. I won’t lie about the portion size though, it’s as small as it looks… but tasted so good! I really want to return to Spago again for the full-sized portion! 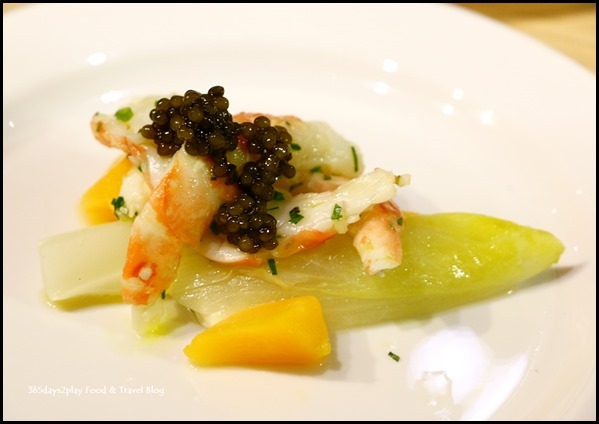 Every year, Waku Ghin will receive the longest queues because it’s the only time you can try Waku Ghin’s signature Marinated Botan Shrimp with Uni and Oscietra Caviar for about $20 (yes just a mouthful) instead of having to pay $400 for a 10-course meal there. Sad to say, this year they don’t have the Botan Shrimp with Uni. The shrimp now comes with compote of egg and carviar only, but because there’s no uni, there’s more shrimp. If you really want uni, it’s a separate dish and paired with scrambled eggs. Still worth a try though because the Botan Shrimp still very delicious. 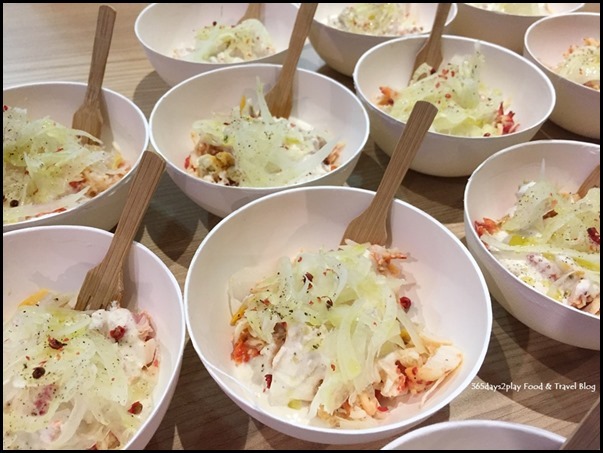 If you love crab, you would love this! Luscious sweet slivers of crab mixed together with a creamy concoction of grape and macadamia milk, and quite moderately priced, considering that certain other dishes such as meat balls already cost $15. 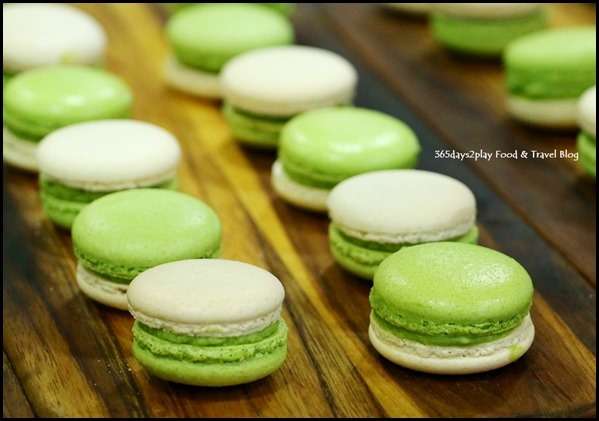 And lastly, don’t leave the Epicurean Market without trying one of these macarons! They’re probably the cheapest items on sale too. 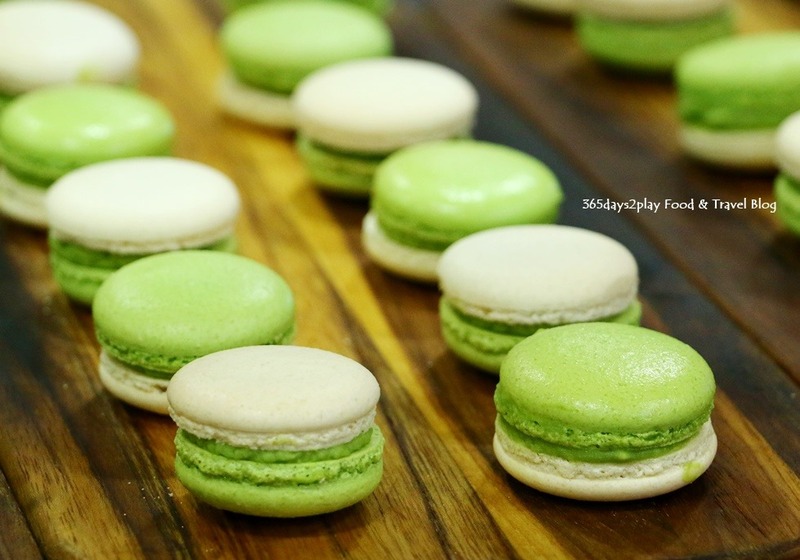 The matcha flavour is nicely pronounced, and the macaron has just the right amount of sweetness to it. I wish I had remembered to purchase a few home! Read my past review of Epicurean Market. Add me on Facebook, Instagram and Twitter if you want to be kept up to date with the latest happenings in the food and lifestyle scene in Singapore! « ME@OUE–Catch unblocked views of the NDP fireworks for $6!